This is one of the most popular Korean dishes. 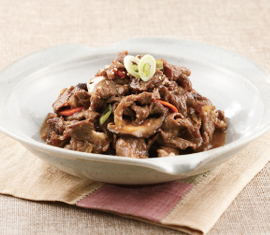 In the olden days, thinly cut beef was marinated then grilled on a gridiron, but today's bulgogi is usually cooked in a pan. ① Thinly slice beef (about 0.3cm x 7cm) and use paper towel to remove excess red juice. ③ Slice carrots, onion 4 and mushrooms. Carrots take longer to cook, so slice thinner than other ingredients. ⑤ Combine ①, ②, ③ and ④ and marinate for 10 minutes. ⑥ In a pan, cook ⑤ on high heat (no oil needed) for 5 minutes than add ④. Sprinkle sesame seeds before serving.